90 item(s) available at last update. 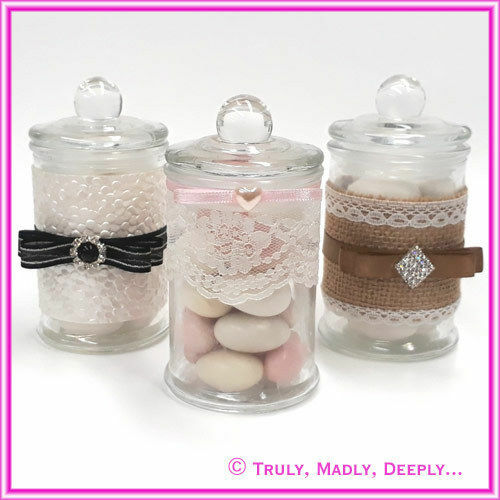 These beautiful little jars are a delight and a beautiful way to give your guests a stunning gift as a wedding bomboniere / favor. They are 11cm high and 5.5cm wide. Ideal to put rock candy, almonds, chocolates and jelly beans. As this is a glass item, it is pick up only. However, if you require a large amount, please contact us to obtain a quote for packing & shipping. The price is for the plain glass jar only, the almonds and decorations (such as ribbons, buckles and lace) are sold separately. See below for recommended accessories. "Get if Fast - Sydney Shop" - pick up or delivery by arrangement.